Katy is creative, knowledgeable, faithful, persistent, and swift to action. These are all qualities that are necessary for leadership, and Katy exudes them all. Katy is involved in many areas of the church. 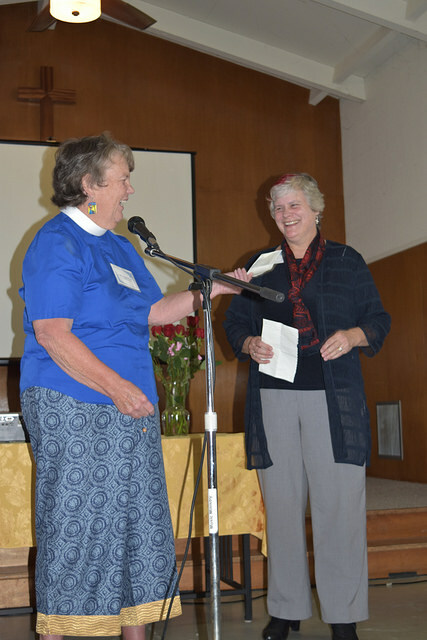 She has served in our vestry, chaired our Strategic Plan Personnel Committee, been an alternate to General Convention, and faithfully represented our community as a Diocesan convention delegate. However, her most recent ministry in EFM, Jail Ministry, and as the Diocesan EFM Coordinator is the reason for her nomination. Katy takes part in 3 EFM classes a week: one at Saint Andrew’s, and two at Elmwood Jail. She has been instumental to many parishioners continued faith formation as an EFM Mentor. She has leveraged her creativity to inspire and engage others, which has had a real world impact. Katy also leveraged her talents to set up an EFM jail program (1st one in the country) and took it a step further and got a second one approved. She needed to work with many agencies to make that happen, along with funding for the classes, co-mentors for each class, and negotiating with Sewanee to get a lower tuition rate so it would all be possible. This is a large ongoing time commitment (there are no class breaks in jail ministry). She is an inspiration and a rock for the guys there, and has even led some to join the Saint Andrew’s community. Katy also volunteered to take on the role of Diocesan EFM Coordinator. She arranged training locally, which was no small feat – normally the closest Mentors could go would be Auburn. This has expanded her outreach beyond El Camino Real, to all parts in California. 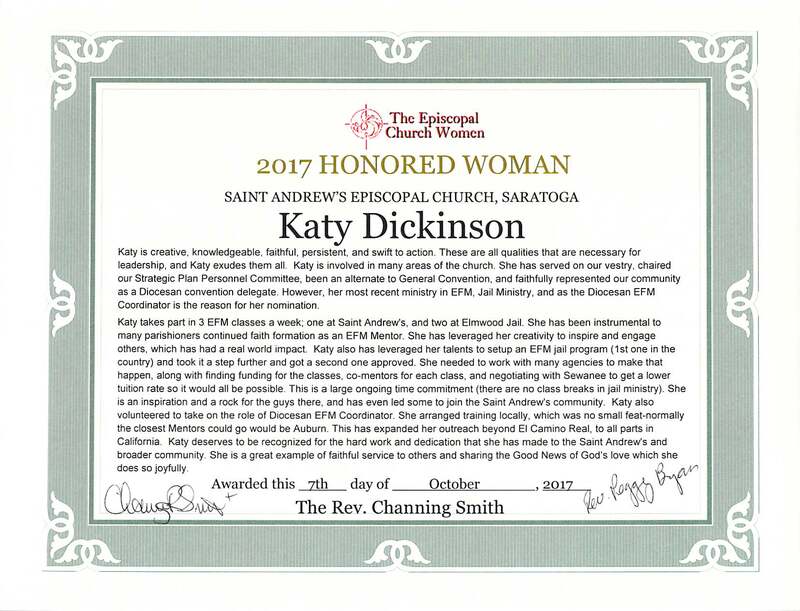 Katy deserves to be recognized for the hard work and dedication that she has made to the Saint Andrew’s and broader community. She is a great example of faithful service to others and sharing the Good News of God’s love which she does so joyfully. I am honored to be included in the ranks of the women leaders of our diocese. Special thanks to the Rev. Channing Smith for nominating me, and to the Rev. Peggy Bryan for asking my inmate students to write notes to present to me with the certificate. 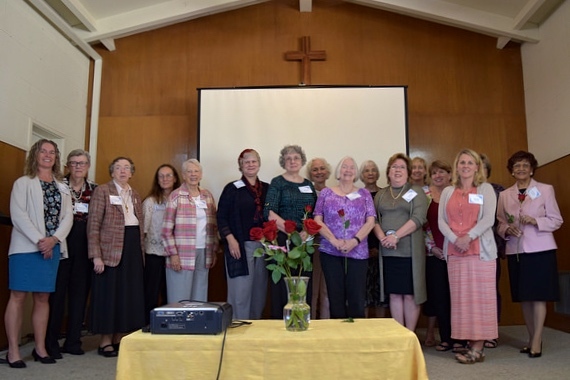 You can read more about the University of the South – School of Theology Education for Ministry (EfM) program and our jail-based EfM seminars on the El Camino Real diocesan webpage. If you are interested in supporting the incarcerated in Santa Clara County, please contact the Correctional Institutions Chaplaincy. Please contact me if you live on California’s Central Coast (Palo Alto to San Luis Obispo) and are interested in becoming an Accredited Mentor for EfM.